This entry was posted on Thursday, October 13th, 2011 at 21:16 and is filed under Election 2012, GOP Candidates, News, Politics. Every day that passes, we learn more about the people who direct the Republican Party, and every day, we get new reasons not to like them. If the people of New Hampshire let themselves be pushed into voting for Romney, they no longer need to tout the motto “Live Free or Die,” but should instead adopt the motto: “Principles don’t matter.” Mitt Romney is using his influence in Nevada to try to push up their primary to push New Hampshire up to December. To Republicans in New Hampshire, if you allow the Romney campaign to prod you forward, you are going to anger the people of your state. Go ahead: Hold your primary during the Thanksgiving-Christmas-New Year period, and prepare to reap the reward. Allowing Mitt Romney to try to steal this primary is an unspeakable act, but polluting the holidays with partisan politics is abominable. The GOP establishment thinks you’re stupid, and they think you will advance your primary into December in order to stay ahead of the others. The party doesn’t care what will happen to your state, and they think you’re too stupid to notice. Any state party that yields half of its representation at the national convention in order to permit one candidate to make a bigger splash than the others isn’t serving their electorate. The Bush operatives still hold sway in Florida, the state that got this all rolling, and now it’s been a domino effect with New Hampshire looking as early as December to maintain its position at the front of the line. Romney is weak in Iowa, and this is about supplanting the influence of Iowa. You need to understand that this is an attempt to steal a primary season, to shorten it up, and to prevent any other candidate(s) from gaining traction, but more importantly, to prevent any Tea Party opposition from gaining traction. It also means there will be all those delegates yielded to the national party for the convention, which will effectively lessen the influence of every state. The people of New Hampshire may be powerless to stop this, and they may not care to because they’ve been told the falsehood that it will improve their influence. Either way, the country loses. As this goes on, what you must know is that whatever the 8-pm (EST) blow-hard or his substitute on Fox News may tell you, Mitt Romney has no business being President of the United States. Fox News has become the establishment Republican propaganda network, and the only thing they’re going to bring to mainstream conservatives is defeat in 2012. Fox News is compromised in many ways due to the Rupert Murcoch/News Corp/phone-hacking scandal. You can bet Obama’s DOJ will play that ace-in-the-hole next fall. In the mean time, Obama and the Democrats are happy to see the Republicans nominate Romney because he is the one candidate in this race they are dead-certain they can defeat. As Tammy Bruce offered today, “I’m wondering now, why the Republicans even should bother to vote in the primaries” as she explains since the Republican establishment is now telling us Romney is the guy. Meanwhile, Cain is moving up as an answer to the establishment, but so is Gingrich. Do you think we can beat Obama with these? The truth is, if we nominate Romney, we deserve to lose. It’s time to tell the GOP establishment: “No more! Enough!” Are we willing to do that? I am. Here’s what I’m going to do: I’m going to treat the GOP like a dirty cop. He should be a good guy, but he isn’t, and in most every respect, he’s as bad as the people from whom he’s been tasked to protect me. You know what I think of such cops? To hell with them! I love good cops, who keep the peace, shield the innocent, and do not partake of graft and corruption, and enforce the laws of our country. When I see a bad cop, however, I don’t care what happens to him because when he battles with thugs, I simply view it as rival gangs at war. That’s the Republican establishment, and the only way I can reduce their influence is to simply cease aggregating mine with theirs. I’ll defend myself, thank you very much, because their sort of “protection” isn’t protection at all. It’s more like a protection racket. I no longer care whether the Republican establishment defeats Obama or not. If they succeed in getting their guy nominated, he’s not going to offer any relief from the attack our constitution is under, whether from Obama or his shills in the media and Congress. The simple fact is that Romney and others like him simply won’t do what it takes. 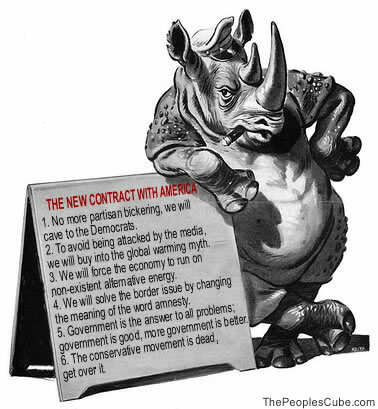 I’ll say it again: Anybody But A RINO. I’m going to focus on the Senate and the House, and every chance I get to stick it to the Whigs Republicans, I will take it. The Republican party was founded in the name of a cause in search of liberty. It will fail if it doesn’t seek to put liberty in the forefront once more, and the GOP establishment is no better than the Democrats in that respect. None. You voters in New Hampshire have a chance to send a message by standing this manipulative nonsense down. Of course, the Romney people are in a hurry to tell you this will increase your influence, but they’re lying to you. We can’t win the sort of election we need in 2012 by being against something. People prefer an affirmative reason to vote. This is why McCain lost, but until his idiotic “suspended campaign,” Sarah Palin was able to boost him: She was that affirmative feature of McCain’s campaign. Whatever surge McCain ever had owed to her presence. While I don’t know who Romney will pick as his VP, maybe somebody to draw in conservatives like Herman Cain, but whomever it is will not rescue his campaign. If conservatives hope to actually reform this government, it’s going to require all hands on deck for a real candidate, but in lieu of that, we’re going to need to learn that we can no longer afford to hold our noses. If a “President Romney” continues the downhill slide of our country, will the left say it’s because “Romney was too liberal?” No. They will state with straight faces that it had been evidence of the failures of “conservatives” and “capitalism.” Bank on it. This is one Nevadan Mittens is not going to push around. Your thinking is right, but don't be fooled any party, be it whichever you choose; they all think we "the American people" are stupid!! Don't pee on my head and tell me it's raining!! I'll take my chances with your "pet goat!!" Ii just wish all this political finagling would stop. Our leaders are supposed to be elected by the people. There shouldn't be any rule that allows the changing of primary dates. This alone is enough for me to NOT vote for Romney. The only other one that I think I would actually want to vote for right now is Cain.. Even with him I have reservations. I just hope that like you said, we win, then we can concentrate on the Senate and House. The only way we're going to save this country is by defeating Obama. I can't imagine what that would mean to this country should Obama win a 2nd term. I've liked following your blog, but your statement that you no longer care if Obama is defeated is simply wrong. Defeating that jerk IS the #1priority. I strongly believe in ABO…..anybody but you know who. Romney isn't my choice either but…..we must face reality. me and the gop dont exactly see eye to eye.